This easy recipe makes a vegan mozzarella with the same texture as real mozzarella! It is the perfect addition to vegan pizza! Simply add all the ingredients to the blender, mix then heat for a few minutes for the perfect creamy vegan mozzarella! Add all the ingredients into a blender and blend for 30 seconds. Pour the mixture into a small pan on a medium heat. 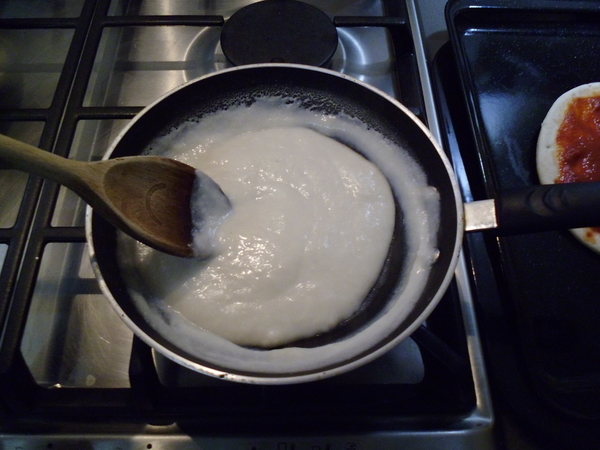 The mixture will start to thicken and lumps will appear. Stir regularly. Once the mozzarella is to the right consistency, turn off the heat. 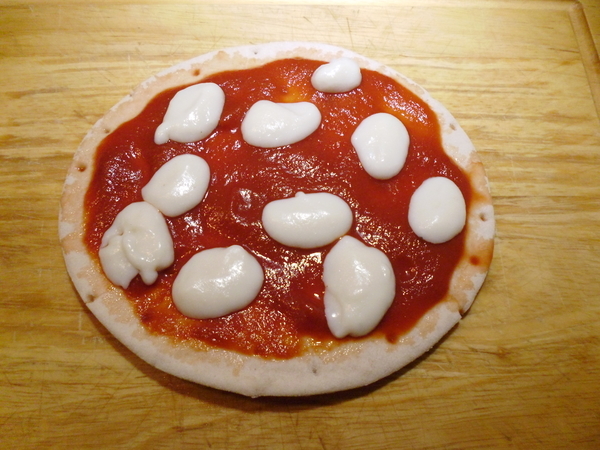 Now using a teaspoon add small dollops of the mozzarella onto the pizza. Store any leftovers in a container in the fridge. Eat within 3 days. As a vegan, one thing I miss is pizza! I made this tasty gluten free vegan pizza recipe using cashew nuts to make the vegan mozzarella and meaty mushrooms instead of ham. If you don’t want to make the pizza bases you can buy ready made gluten free pizza bases in the shops. Soak the cashew nuts in water over night. Firstly to make the pizza dough, put the flour, salt, yeast and sugar into the food processor and mix. Place the flaxseed, water, vinegar and olive oil into a bowl and mix. Add the liquid into the food processor with the motor running until the dough forms a ball. Now take out the dough and leave it to rise in a covered bowl in a warm place for 30 minutes. Next cut the dough in half and put one half aside. Place the dough on a sheet of baking paper. Roll the dough with a rolling pin to form a 2mm thick pizza base. Place onto a baking tray. Repeat with the other half of the dough. Place the pizza base in the bottom of the preheated oven and bake for 10 minutes. To make the topping, add the olive oil to a frying pan on a medium heat. Slice the onion, pepper and finely slice the mushrooms. Add to the pan along with the finely chopped garlic. Also season with the salt and pepper and stir in. Fry for 5 minutes until the mushrooms are browned, turning them over once. To make the vegan mozzarella, add the soaked cashews, olive oil and water into a blender. Squeeze the juice of half the lemon into the mix. Blend on a low speed for 30 seconds. Now spread the passata onto the pizzas using the back of a spoon. Sprinkle on the oregano and basil. Use a teaspoon to drop on splodges of the vegan mozzarella. Also add half the red onion, pepper and mushroom topping onto each pizza. Cut the olives in half and place on the pizza. Now bake each pizza in the preheated oven for 15 minutes or until the pizza base is golden and crisp around the edges. Finally cut into slices and serve warm.